This very old cathedral city on the river Rhine is one of the most important commercial and cultural centers in western Germany. Cologne (Köln in German) is famous for its 12 great Romanesque churches - especially the magnificent Cologne Cathedral - all an easy walk from the historic Old Town. Its university is one of the oldest and largest in Europe. Cologne can trace its roots back to the first century AD, when it was established as a Roman provincial capital and military stronghold, and one of its most appealing features for tourists is that it retains elements from all the various periods of its long history. Among its attractions are Roman remains, medieval churches, Baroque palaces, and museums that reflect such diverse subjects as its darker times in the mid-20th century and the various products for which it is known: fragrances, mustard, and chocolate. Cologne's importance never really slowed, and today, the city remains one of Germany's most important cultural centers, home to numerous arts and entertainment facilities, along with more than 100 galleries and at least three dozen museums. So you'll never run out of things to see and do in Cologne. Near the left bank of the Rhine, Cologne's towering landmark, the Cathedral of St. Peter and St. Mary, is a masterpiece of High Gothic architecture, and a UNESCO World Heritage Site. One of the largest cathedrals in Europe, it was started in 1248 and is considered the most ambitious building project of the Middle Ages. As impressive as its 157-meter-tall twin towers is the cathedral's incredible interior. Covering an area of 6,166 square meters, its soaring roof supported by 56 pillars, the cathedral is filled with treasures: the 12th-century Reliquary of the Three Kings created by local goldsmiths; the famous relief of the Adoration of the Kings from 1440; the Treasure Chamber, with precious objects that include ancient reliquaries and manuscripts. Panoramic views from the south tower are reached by more than 500 steps that pass the cathedral's famous bells (ear protection is provided on Sundays). A variety of excellent guided tours are available, as well as events, including concerts and services (be sure to check for closures prior to arrival). As you explore Cologne's numerous historic churches and museums, you'll crisscross the city's lovely Old Town. In addition to old churches such as Great St. Martin, you'll find yourself traversing countless alleys lined with traditional old houses, many now home to boutique shops, galleries, cafés, and restaurants. And with its many pleasant paths along the Rhine, you'll find ample opportunity to enjoy great views as you plan your route through this ancient city. You'll also find yourself in awe of the countless monuments and fountains that adorn the area, along with its Archaeological Zone, with its many ancient ruins and artifacts. A particular highlight in this area is Cologne's Old Town Hall, the Kölner Rathaus, the oldest such public building in Germany. With a rich history dating back more than 900 years as the focal point of the ruling classes during medieval times, the building you see today reflects a number of different architectural influences, including the 14th-century main building, the 15th-century tower, and a Renaissance-style loggia and cloister. Even the 20th-century influences are pleasing, as seen in the atrium. Other highlights include the Hansasaal, or Hanseatic Hall, with its Gothic figures of eight prophets; the nine "good heroes" (pagan, Jewish, and Christian); and its sonorous carillon that plays three times each day. It would be a shame to visit this beautiful city without viewing it - and its nearby river scenery - from a boat on the Rhine. On a one-hour Cologne Sightseeing Cruise, you'll get unparalleled views of Cologne landmarks, including the twin-spire of Cologne Cathedral, the picturesque buildings of the Old Town, and the Hohenzollern Bridge. One of the most popular things to do in Cologne at night is the Rhine River Evening Panorama Cruise, a leisurely two-hour excursion to see the city aglow with lights. You can enjoy the views as you savor regional specialties from a buffet on board the three-hour Cologne Rhine River Dinner Cruise. To see even more of the Rhine Valley, join a Rhine River Cruise to Königswinter or spend an entire day exploring the Rhine and Mosel rivers and their charming towns with a hop-on hop-off KD Rhine Pass from Cologne. Art lovers will want to visit both the Wallraf-Richartz Museum and the Ludwig Museum when in Cologne. Housed in one of the city's newer architectural structures, these two excellent galleries cover a wide range of European painting, with works by Rembrandt, Manet, Renoir, Leibl, Liebermann, and Slevogt. The Wallraf-Richartz Museum is particularly strong in the work of the Cologne school, while the Ludwig focuses on modern and contemporary painting. In the same building is the Agfa-Foto-Historama with its displays of photographs and cameras dating back to 1840. Those with an interest in life under the Nazi regime and its aftermath will want to visit this memorial that gives an unvarnished account of its horrors, especially for the citizens of Cologne. A combination memorial site, interactive museum, and research center, it is set in the actual building where prisoners were held by the Gestapo, and its most chilling experience is entering the actual prison cells in the basement with the writing of prisoners scratched into their walls. The center attempts to put a human face on the effects of the police state on both Germans and occupied countries, with individual stories. It also focuses on the long aftermath of the Nazi era and the efforts to bring those responsible for its atrocities to justice. Founded in 1860, Cologne Zoo is one of Germany's oldest zoological gardens, as can be evidenced in its fine collection of 19th-century menagerie buildings, including its Moorish-style elephant house and an old birdhouse (now home to chimps) resembling a traditional Russian church. Other highlights include Ape Island with its mock rainforest; a well-stocked aquarium; and an excellent big cat enclosure, a biotope habitat where visitor view the animals through glass without bars. One of the most appealing features of the zoo is that you can see its history - and attitudes toward zoos - unfold over the years, with modern facilities retrofitted into historic buildings of the original menagerie. Since its establishment in 1957 as the first European cable car to cross a river - in this case, the Rhine - the Cologne cable car has carried millions of passengers. 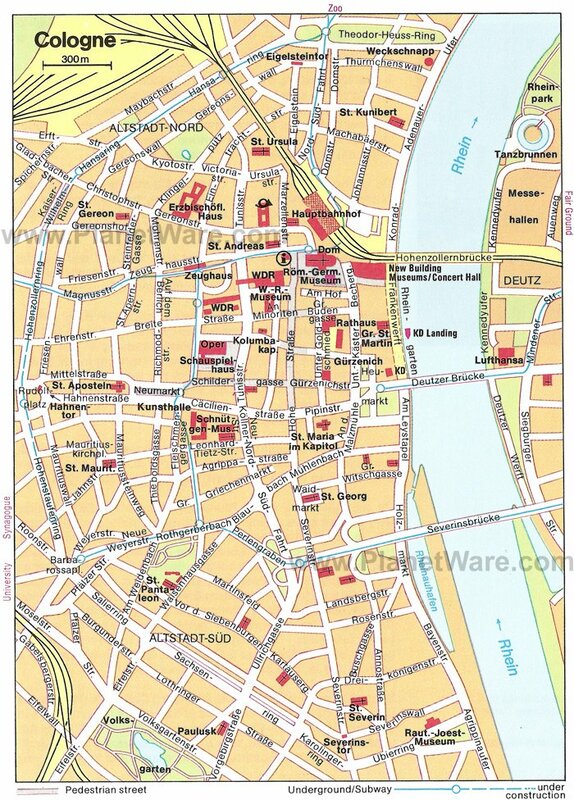 The views are, of course, the big draw, particularly those of the Old Town and Cologne Cathedral. For more great views, a visit to Cologne Telecommunications Tower is worthwhile. Located northwest of Cologne's Old Town, Colonius, as it's known locally, is 243 meters high with a superb viewing platform and a revolving restaurant. KölnTriangle, a striking contemporary building on Ottoplatz, also has a panoramic viewing platform. Cologne's Chocolate Museum (Schokoladenmuseum) can trace its roots to 1972, when Hans Imhoff acquired the Stollwerck chocolate factory and discovered there a rubbish container filled with broken machinery, packaging material, and other remnants of chocolate manufacture. He began preserving and restoring these as the basis for the museum, where exhibits follow the entire process from bean to bonbon. There are interactive displays, collections of molds, antique chocolate boxes and wrappers, free samples from the chocolate fountain, and a working production line where you can watch chocolates being made. You can even design your own chocolate bar to take home with you. Established in the 19th century near the riverbank in Riehl, a northern district of Cologne, the Botanical Garden covers 11.5 hectares with more than 10,000 species of plants. You can stroll through this public park to learn about the plants or simply to enjoy the beautiful and colorful flowers arranged in formal beds throughout the growing season. All year-round you can be in the tropical settings of the greenhouses and the Palm House. Serving as an elegant backdrop to the gardens is The Flora, a historic building that hosts flower shows, concerts, and events. Just a few minutes' walk from Cologne Cathedral, the Roman-Germanic Museum offers a fascinating insight into the city's rich archaeological heritage from the Paleolithic period to the early Middle Ages. Exhibits of interest are the Dionysus Mosaic dating from the 2nd century and the 15-meter-high funerary monument of Poblicius from the 1st century, both discovered during excavations in the city. The museum also displays other mosaics, Roman glass, domestic pottery and sculpture, and Roman and Germanic jewelry. Also of interest is Kolumba, the art museum of the Archdiocese of Cologne, notable for its art and antiquities. In the picturesque town of Brühl, 15 kilometers south of Cologne, Schloss Augustusburg is the 18th-century palace of the Archbishop of Cologne. Sumptuously decorated and furnished, this charming Late Baroque/Rococo palace is famous for its magnificent staircase hall. Other highlights include its large park, used for open-air concerts and festivals. Sharing the same park is Falkenlust Palace, built in 1740 and an important part of this World Heritage site. Brühl is also home to several museums and historic sites, including one dedicated to surrealist artist Max Ernst, as well as Augustusburg Castle and Castle Falkenplatz. Kids will enjoy visiting Phantasialand, one of the largest theme parks in Europe, with a cable car, a Viking boat trip, a monorail, and a reproduction of old Berlin. Romanesque St. Gereon's is perhaps Cologne's most unusual church, built on the site of a former 7th-century church. That church was itself constructed in the 12th century on a ten-sided domed structure dating from Roman times (and still visible). Dedicated to Saint Gereon, this visually appealing structure has an unusually long choir, and is filled with medieval murals, mosaics, and ancient relics. Just six kilometers away from its famous cousin in Cologne, Altenberg Cathedral, also known as the Bergischer Dom, is one of the finest examples of Early Gothic architecture in the Rhineland. Built in 1259, its richly furnished interior includes Gothic stained glass and many tombs of princes and abbots. Although not strictly speaking a formal cathedral - no bishop has ever sat here - it earned the title thanks to its imposing dimensions and is unique in Europe in that both Protestant and Catholic congregations share it. Southwest of Cologne Cathedral is the Museum of Applied Art. One of the city's "newer" museums - it was founded in 1888 - it's well regarded for its fine collection of more than 100,000 pieces of applied and decorative art from the medieval period onwards. Other important collections include jewelry, furniture, porcelain, arms and armor, as well as a number of interesting architectural exhibits. Luxury Hotels: Popular for its views of Cologne Cathedral and minutes from Cologne Central Station, the Excelsior Hotel Ernst offers large, sumptuously decorated rooms and suites along with a modern spa and large gym. Also handy for those arriving via rail, the Savoy Hotel offers bright, quirky décor and mood lighting in its large rooms as well as throughout its public spaces. Although located on the opposite bank of the Rhine, the large rooms of the Hyatt Regency Cologne boast superb views of both the river and cathedral, as do the indoor pool and sunbathing deck. Mid-Range Hotels: Popular for its large bathrooms and intimate size, the modern, boutique-style Stern am Rathaus boasts friendly staff and one of the city's best breakfasts. Another small hotel worth considering is Hotel Domstern, with hearty breakfasts and dedicated parking. Also popular is the refurbished CityClass Hotel Residence am Dom, with its ultra-modern décor and furniture. Budget Hotels: Affordable and an easy walk from Cologne Cathedral, Hotel Engelbertz is popular for tourists wanting a traditional German style hotel experience: small, intimate, and family-run. Other great budget choices in the Old Town include Ibis Koeln Am Dom, with its fun lounge overlooking the cathedral square, and the family-run Hotel Im Kupferkessel, with its cozy, brightly-painted rooms and homey dining area. 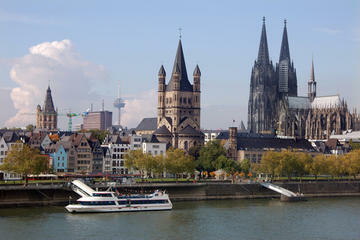 Cologne is well situated for exploring this interesting part of western Germany. It is north of Bonn and south of Düsseldorf, two other attractive cities in the Rhine Valley. 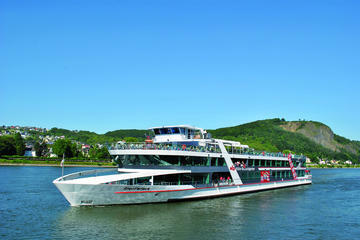 Farther to the south, Koblenz is at the point where the Rhine meets the Mosel. Germany's westernmost city of Aachen is close to the borders of both Belgium and the Netherlands, and from here, you can easily reach the Dutch city of Maastricht and the Belgian city of Liège.